The Union Budget 2019-20 was announced by finance Minister Shri Piyush Goyal on 1st February 2019. The Finance Minister emphasized how the Budget was a full-fledged budget, and not merely a “vote on account” or “interim budget”. One of the key takeaways was that for FY19, the fiscal deficit target has been revised up to 3.4% of the GDP, up from the budget estimate of 3.3%. A major new scheme announced was Pradhan Mantri Kisan Samman Nidhi, under which INR 6,000 crore per year will be transferred directly to the bank accounts of the farmers having less than 2 hectares of land in 3 instalments. Another major development was the announcement of a one-time tax rebate for individuals having a taxable income of up to INR 5,00,000 per year. Similarly, a series of benefits was announced including no tax on rental income of up to INR 2.4 lakh on second house, capital gain benefit under Section 54EC doubled to INR 2 crore and allowing it to be deployed in 2 houses. The Finance Minister also stressed how the Insolvency and Bankruptcy Code has improved recovery from banks, specifically to the tune of INR 3 lakh crore. Finally, a new committee under Niti Aayog was announced to identify the most marginalized communities not currently classified as SC, ST or OBC and implement the recommendations of Idate Commission that are possible. Prof. Sanjeev Parashar, Dean Academics at IIM Raipur, appreciated the inclusion of provisions regarding low-cost housing as a stimulant of employment. He linked the same to an expected growth in the cement, steel and allied sectors which would all drive economic growth. 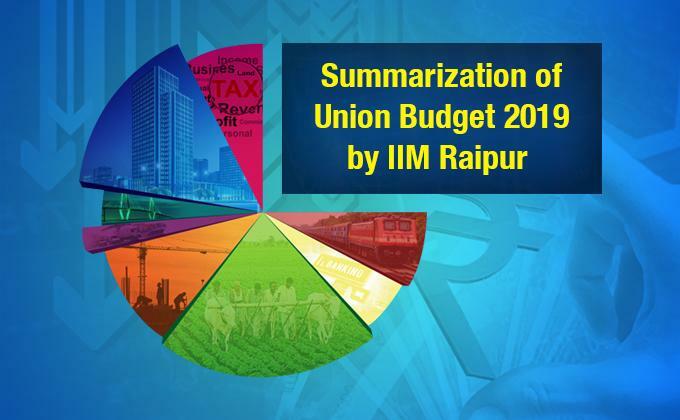 Prof. Satyasiba Das, faculty in Strategy at IIM Raipur, similarly stated that the Budget was socially inclusive. Having steps like the introduction of a minimum pension to the unorganized sector would pave the way for a more holistic economy with a greater and more equitable distribution of income. Prof. Vinay Goyal, faculty in Finance and Accounts at IIM Raipur, opined that the budget was a very well balanced one considering the elections and noted an expected rise in disposable income. Prof. Goyal surmised that the budget would be a big boon to the middle class by way of the exemption awarded in income tax of income up to INR 5 lakh. An individual saving INR 1.5 lakh and having housing loan in the below INR 5 lakh bracket could have an income up to INR 8 lakh exempt. Prof. Yogesh Chauhan, faculty in Finance at IIM Raipur, similarly had a positive outlook with regard to the income tax limits and the Pradhan Mantri Kisan Samman Nidhi Yojna, while noting that a higher allocation could have been possible for the same. Similarly, while he praised schemes such as the Pradhan Mantri Shram Yogi Bandhan, he noted that the budget did miss some big events for the industry. Prof. Chauhan called the Budget an overall pro-farmer and pro-middle-class budget. The students shared similar views on the budget. Mayank Pamnani, a first year student at IIM Raipur, praised the social outlook of the budget and called it public-friendly. He praised the tax benefits awarded to the middle class and the myriad farmer-centric schemes the budget brought with itself. Abhivyakti Sengar, another first year student at IIM Raipur, was similarly appreciative of the budget and its provisions towards the welfare of the farmers and the unorganised sector. She had some apprehensions regarding the revision of the fiscal deficit, but had an overall positive opinion of the budget. Similarly, Arpit Bansal, another first year student at IIM Raipur, called the budget progressive. He appreciated the major focus on boosting farmer incomes while reducing personal income tax to increase consumption by the middle class.